Two songs from the late Nipsey Hussle are among the greatest gainers while a 3-year-old track from 50 Cent and Chris Brown soars into the Shazam USA Top 10 after a placement in Kevin Hart’s Netflix special. Hart’s Irresponsible features the G Unit remix from May 2016. The Nipsey Hussle songs are two of the four tracks that charted after his murder. “Racks in the Middle,” his best-selling/most streamed cut, has attracted the most thumbs. 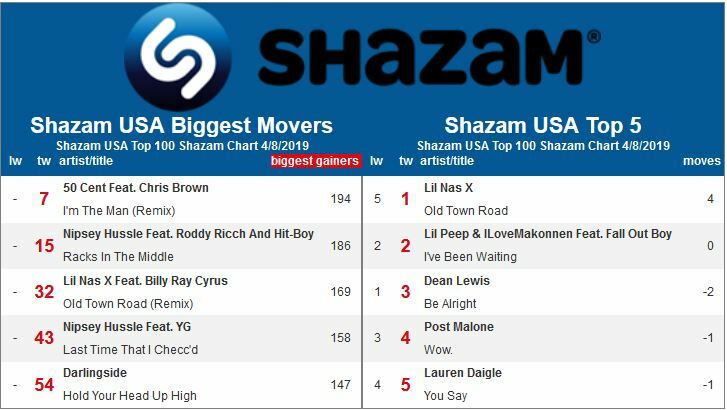 Columbia’s Lil Nas X, who’s already rewriting rules and records, is attracting ears and thumbs with his Billy Ray Cyrus remix of his “Old Town Road.” Darlingside, an indie folk-pop band out of Boston on Thirty Tigers, land on the greatest gainers list after a synch on NBC’s This is Us.